Australia Day is fast approaching, so what better way to celebrate then with some low FODMAP barbeque lamb! Lamb, along with other sources of animal protein, is naturally low in FODMAPs owing to the negligible carbohydrate content of meat. The only thing to be mindful of when eating meat on a low FODMAP diet is the inclusion of other high FODMAP ingredients, for example marinades and sauces made using garlic and/or onion. Otherwise, meat is safe to include on a low FODMAP diet and is extremely nutritious. Lean meats such as lamb, beef, pork, chicken and fish are excellent sources of iron, zinc and B group vitamins. Spread lamb out in a shallow dish. In a separate bowl, combine lemon, oil, mustard and thyme. Season to taste. Pour marinade over lamb, turning to coat. Set aside for 30 mins (longer if you have time). Turn occasionally. Meanwhile, preheat a barbecue plate on high. Reduce heat to medium. Cook lamb for 4-5 mins on each side, or until cooked to taste. Rest, covered for 5 mins. Chargrill zucchini for 1-2 mins on each side until tender. 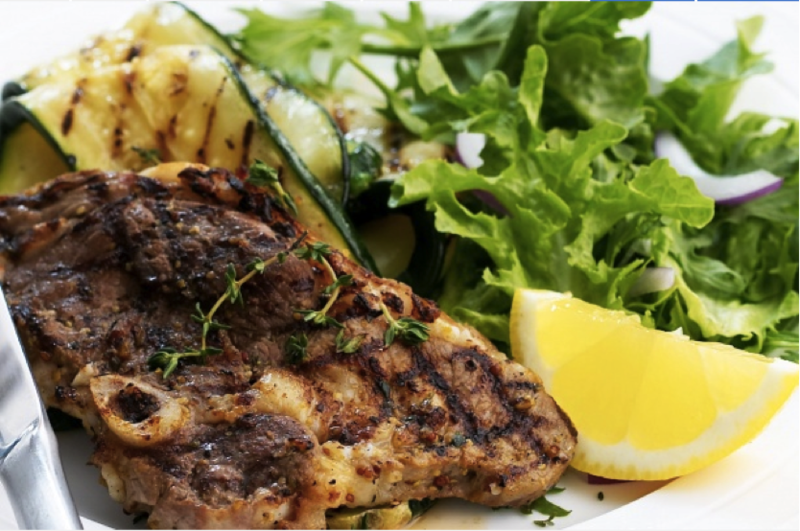 Serve lamb with the zucchini, salad and a lemon wedge on the side.